A new IMAX poster and Japanese trailer have been released for Godzilla, and the trailer doesn’t tell us much. It’s kind of cool that the studios have managed to keep the plot under wraps for this long. If you’re not going to fully reveal the monster, why reveal any unnecessary details about the plot? It’s Godzilla. Godzilla fights other monsters. Humanity tries not to die. Roll credits. As for these new pieces of marketing, the film gets another great poster (I’d be disappointed if the IMAX poster for Godzilla was weak) and the Japanese trailer has some bits of new footage. However, I was surprised to learn that the movie doesn’t open in Japan until July 25th. Why do they get it months after we do? Japan is Godzilla’s home! 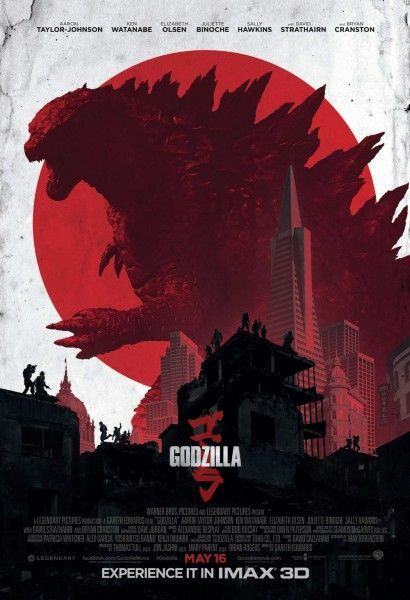 Hit the jump to check out the Godzilla IMAX poster and Japanese trailer. Click here for our recap of the WonderCon panel, and click here for Steve’s interview with director Gareth Edwards. The film opens in 2D, 3D, and IMAX 3D on May 16th, and stars Aaron Taylor-Johnson, Bryan Cranston, Elizabeth Olsen, Ken Watanabe, Sally Hawkins, Juliette Binoche, and David Strathairn. Via Warner Bros. and Legendary Pictures.